sorry I missed the last planning "phone call" … arriving a little earlier than normal (Tuesday afternoon) due to logistics considerations. Departing Saturday night NLT about 9pm. Will be looking to play events hosted by Larry Bond and Mark Walker … beyond that I think everything else is negotiable … I love volunteer GMing with the ADs … but still this is a primarily a gameplaying CON for me. Hey, all! I'm headed to Origins this year and was wondering what sort of wargaming events will be run or how I might find people to play games with. I'm interested in playing and learning anything, but wouldn't mind getting games of LnLT, COIN, or Triumph and Tragedy in. How can I find other wargamers? Would people recommend getting the board room pass or is that mainly targeted at the Euro crowd? 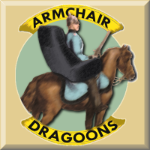 We've got a few errors with getting our events loaded on the Origins events grid right now, and I'm trying to sort it out, but once the event grid is open, there's an ability to search on "Armchair Dragoons presents..." and find our events that way. We're planning on LNLT, A Distant Plain, and others at our area. What's an "Origins?" Is that like a front page? I'm not sure I want to click on his articles. I've heard that his demonstratives and possessive determiners are a bit dodgy as well. I'm just a hack, boys. Don't even bother. Thanks, Brant for the info. I found the geeklist and it does look like a lot of gaming is going to happen in the board room, so I guess I'll pick that up as well. I went to Origins in 2016 as a booth monkey, but I was able to spend some evening participating in the grogheads events. I'm definitely looking forward to being able to explore games that are hard for me to get to the table. I'm bringing my (much) younger brother this year and he's really into 40k. I saw a few 40k events on the schedule, but not much else. Does anyone know how much GW / 40k presence there is at Origins? There's not a ton, honestly. There's no official GW presence as a vendor, so the exhibit hall sales are limited to third-party vendors who are more interested in just moving product than sponsoring organized play or anything similar. There's some groups that'll set up in the minis area, but that's probably what you already found on the event grid. So, I am looking forward to your post of the ADP events before then if able. Thanks.